The nation’s premier summer college baseball league will be coming to Boston when the Wareham Gatemen take on the Yarmouth-Dennis Red Sox at Boston College High on June 12. The game will start at 6:30 p.m., will be free to the public, and will feature activities for fans such as a batting cage and “pitch-fast” station. Both the Gatemen and the Red Sox are eight-time Cape League Champions, with the Gatemen entering the 2019 season as the defending champions and the Red Sox having won three consecutive champions from 2014-2016. Both the Gatemen and the Red Sox had alumni making big impacts for the Boston Red Sox in their run to the 2018 World Championship, as Joe Kelly was in Yarmouth-Dennis in 2008, Chris Sale played for Yarmouth-Dennis in 2009 and Matt Barnes pitched for the Gatemen in 2009 and 2010. The Gatemen and Red Sox have also both produced baseball legends, with Red Sox fan favorite Mo Vaughn playing in Wareham in 1987 and 1988 and Baseball Hall of Famer Craig Biggio spending the summer of 1986 with Yarmouth-Dennis. The Cape League has been a reliable pipeline to the pros and eventually to the Major Leagues, with at least 200 alumni drafter and another 200 appearing in the Big Leagues in every season since 2007. 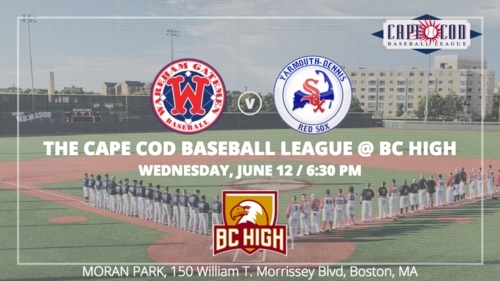 The contest at BC High will be one of two opportunities to see a 2019 Cape League contest off the Cape, as the Gatemen and Red Sox will also face off in Hartford, Connecticut on July 23.